Let me introduce you to our dogs. 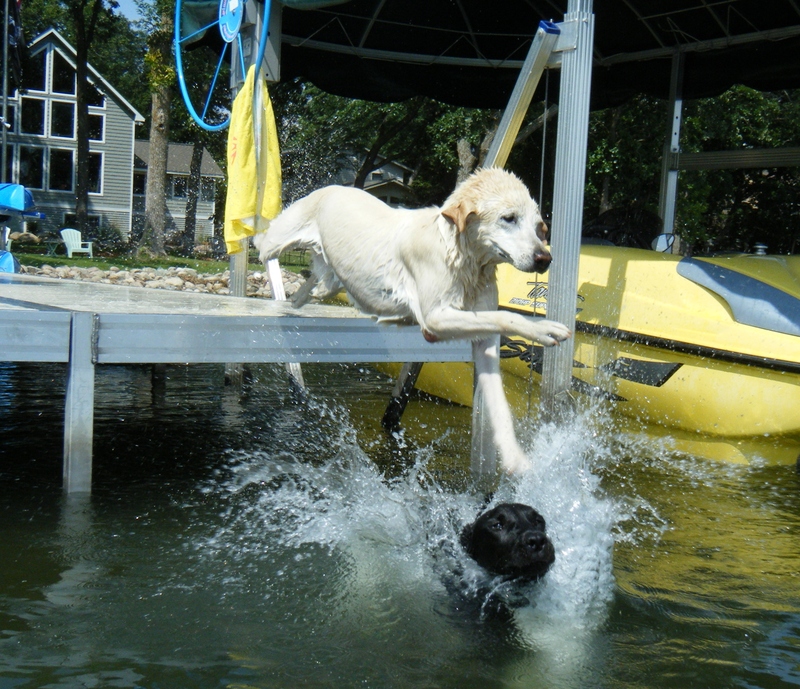 The six month old British Black Labrador Retriever is Jett and the 10 1/2-year-old American Yellow Lab is Duke. What you see them doing in this picture is their passion; well, at least one of them: swimming. Hunting and especially eating are a couple of others. They are called water dogs, gun dogs and/or retrievers. These passions were intentionally bred into them. They were born for a purpose and when presented with the opportunity to participate in their purpose, they know it instinctively, and their purpose brings them to a higher level of life. People are not so different. I believe we are each born with an innate passion to do or be something. The disconnect is that we don’t have a trainer or handler to lead us to it. Although I would suggest that if we have a relationship with our God, that He can play that part for us. Even so, we have to rely on feeling it welling up in spirit, recognizing and intentionally harnessing and developing it by seeking out teachers when we come across it in the course of our lives. If we are sleeping through life, or covering up these feelings with other things like over-working, over-drinking, over-medicating ourselves etc., we are dulling the instinctive feelings that exist within all of us. We become deaf to our calling, and therefore lead aimless lives deplete of purpose. Perhaps we have confined ourselves in a passionless box made by our own doing by buying into the negative stereotypes of aging. If this is the case, the world stands to lose the wonderful talents and gifts we were born to share with it. And we lose our reason, purpose and ability to be fully alive for all our lives. Looking at Duke caught up in the midst of his passion, I can see how he is benefitting from letting his passion lead him to jump playfully into the water. He becomes fully alive, joyful and his age doesn’t show in comparison to that of his “brother,” Jett. From the expression on his face, the glow in his eyes, the quickness of his steps and the abandonment he demonstrates when jumping wholeheartedly into the water, the benefits to him of his passion are obvious. He becomes an ageless spirit led by this passion. The beauty of all of this is that every one of us can launch, like Duke and Jett are doing in the picture, into the passion of our lives if we are aware, positive and open to the experience of it. ← I Am Old: Can You See Me? Thanks for the reminder, Kathy! passion cant be taught..truly=bred into us.great read.thankyou! Excellent, that is what the Senior Learning Network is all about!